Apple cider vinegar, or ACV, has almost limitless applications when it comes to maintaining good health. From aiding in weight loss to maintaining healthy heart function. ACV is an amazing tonic for keeping yourself healthy and treating ailments ranging from obesity to diabetes, and virtually everything in between. Now, we can add another ailment to the ever-growing list of disorders that can be treated using ACV: arthritis. Osteoarthritis (OA) – This type of arthritis is most commonly associated with aging and it’s characterized by chronic inflammation of the joints. Rheumatoid arthritis (RA) – This is the most common type of arthritis that causes inflammation and it predominantly affects the joints in the body. It is classified as an autoimmune disease and researchers are just beginning to understand it. Part of the reason for ACV’s pain-relieving effects are its high acetic acid content, which can help to negate excessive acidity in the blood that can lead to inflammation and thus, pain. 2 While ACV contains aetic acid, once ACV is metabolized in the body, it turns alkaline. ACV is also rich in antioxidants, which can help to ward off the damage from free radicals in the body that can contribute to stiff, painful joints in people suffering from arthritis. The pain-killing properties of ACV work well for people with osteoarthritis who suffer with joint pain. Poultices and spot soaks can be quite effective for osteoarthritis pain management, as well as internal use. Consuming ACV can help to balance the body’s pH levels in favor of joint pain relief, reducing acid buildup that can contribute to severe joint pain for people afflicted with osteoarthritis. ACV can work directly on the inside of the body when you consume it in food or drink, and when taken this way it can help to dissolve crystals that build up along the joints in people suffering with rheumatoid arthritis, allowing the crystals to be flushed from the body along with the urine. This, paired with the natural analgesic properties of the vinegar itself (whether consumed or used topically), can bring relief to those who suffer with RA. Apple cider vinegar has been used in folk medicine for millennia, but its benefits are not limited to being lauded by personal anecdotes and old wives’ tales. As I mentioned earlier, ACV’s beneficial effects can be amplified when it is combined with other substances, such as sesame seeds, gelatin, turmeric extract, or tart cherry juice. Brew a cup of peppermint or ginger tea, and mix in 1 tablespoon of ACV, 1 teaspoon of honey, and stir in 1 teaspoon of cinnamon. Drink this mixture once per day to relieve arthritis pain. The combination of ACV and honey has a number of health benefits and it also works for better joint health and joint pain alleviation—and the flavor is quite nice. Mix 1 tablespoon of ACV into an 8 oz glass of water and drink it twice a day with food. Although the taste isn’t wonderful, the dilution helps to take some of the “bite” out of the vinegar flavor of this recipe and helps to reduce damage to tooth enamel and prevent burns to the sensitive tissues in your mouth and throat. You can add a honey (it has 13 health benefits) to sweeten the vinegar water. Mix a tall glass (8 to 10 oz) of tart cherry juice with 1 tablespoon of ACV and drink it once per day to get the one-two punch against arthritis pain from this synergistic mixture of two of nature’s anti-inflammatory medicines. Another option is to add a juice of this fruit, which can halt Rheumatoid Arthritis (RA). There is no scientific evidence that soaking the painful joint in ACV helps to reduce the pain. However some people use vinegar as a topical treatment, a vinegar bath or spot soak. To spot soak an inflamed and painful joint (such as an elbow or the joints in the hands), mix one cup of ACV into 6 cups of warm water and soak the pained area for 30 or more minutes for pain relief. Alternately, you can treat your whole body by adding 2 cups of ACV to a full tub of warm bathwater and soaking for a half an hour, massaging the muscles and joints during the soak. For more ideas, read my post about detox baths to cleanse and rejuvenate your body. To create a joint massage oil made with ACV, just mix olive oil or coconut oil with ACV, using a ratio of 2 parts ACV to 1 part oil. Massage this mixture into the pained joints once or twice each day to reap the analgesic rewards of ACV (and the oils will help the skin in the area to glow, as well). You can also add one of these essential oils to relieve pain and inflammation or make your own dandelion oil for arthritis and joint pain relief. I’ve already mentioned the immense health benefits of ACV and honey. The combination is ideal for rheumatoid arthritis sufferers, mixing vinegar with honey and diluting them in water is a quick, easy and natural way to battle serious arthritis pain. Put 1 tablespoon of ACV and 1 teaspoon of honey into an 8 oz glass of water and stir well, then drink. This can be done up to three times per day until pain subsides. Real ACV is made by fermenting pressed apple juice until the natural sugar turns into vinegar. The ACV you should use is the raw, organic, unfiltered, and unpasteurized kind of ACV. Not the refined kind. A good quality kind of ACV contains the “mother” of vinegar, which is the cloudy stuff that sinks to the bottom of the bottle. This substance contains the beneficial enzymes, bacteria, pectin and trace minerals that makes ACV so good for you. Raw unfiltered ACV can be purchased in some supermarkets, health food stores or online stores where you can purchase this Bragg Organic Raw Apple Cider Vinegar. You can also make your own DIY apple cider vinegar. – Read my article about a common vitamin deficiency that was found to trigger arthritis pain. 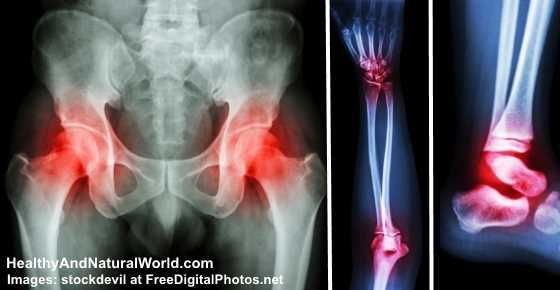 – Natural remedies for arthritis. – Here is a list of foods to avoid if you suffer from arthritis. My mother in law has tried these as well but also incorporates essential oils to reduce the swelling and inflammation. She used peppermint, lavender, lemon, frankincense, marjoram, and rosemary in a blend everyday. Her shoes didn’t even fit because her feet were so swollen but now she can wear her old shoes and ditch the Velcro ones! My sister has arthritis in her hands and prefers natural treatments too. She has been using Banish My Pain with good results, but I’ll tell her about the ACV.